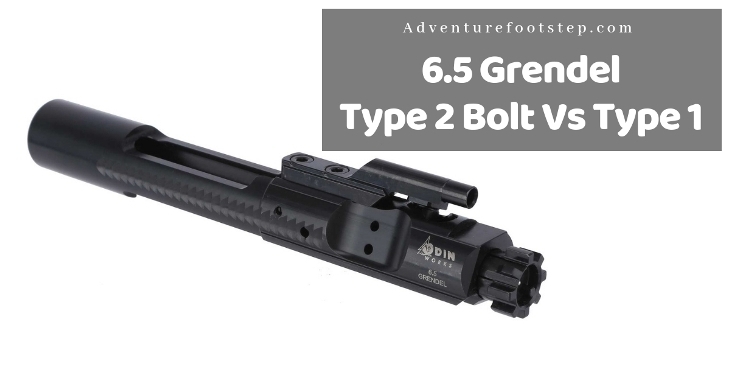 →6.5 Grendel Type 2 Bolt Vs. Type 1: Which Is Better? 6.5 Grendel Type 2 Bolt Vs. Type 1: Which Is Better? There are two types of bolts/chambering for the 6.5 Grendel. They are 6.5 Grendel Type 2 and 6.5 Grendel Type 1 Bolt. Both 6.5 Grendel Type 2 Bolt and Type 1 Bolt have the same case head diameter of 7.62x39 mm. However, the significant difference between them lies in the depth of the bolt face (or head spacing). The 6.5 Grendel type 2 bolt or original Grendel was designed to be used with a Grendel bolt, or a 0.135/0.136 bolt face. Meanwhile, the 6.5 Grendel type 1 bolt has a 0.125 bolt depth. This difference starts with the following exciting story. The 6.5 Grendel type 2 bolt was under the copyright of Bill Alexander. But he was upset that SAAMI did not grant his invention a patent, makings Type 1 come being. To avoid legal troubles, the manufacturer Les Baer Custom Inc. modified the 6.5 Grendel barrel and turned it into 0.125 bolt face. 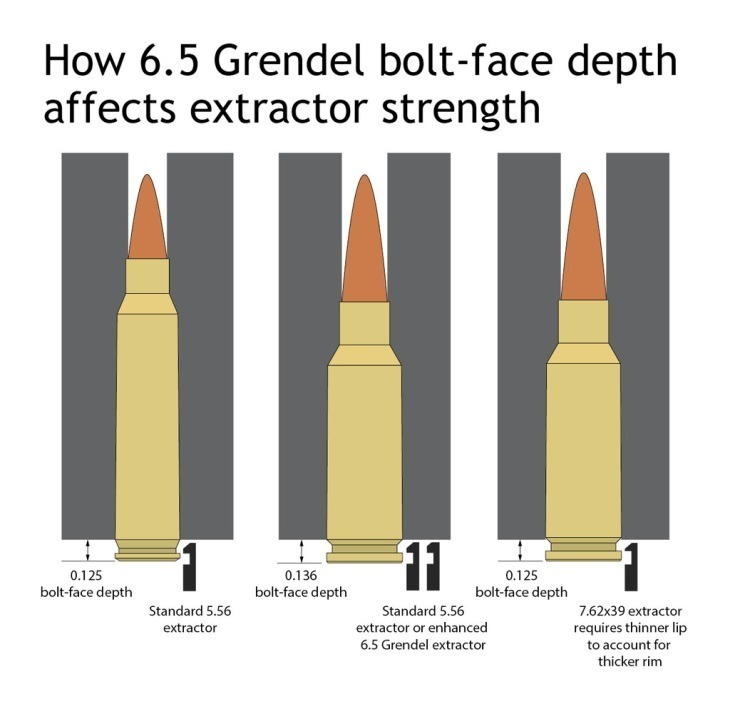 The bolt depth of each type of 6.5 Grendel will affect the extractor strength. From this, we can understand that SAAMI did not approve the 6.5 Grendel Type 2 bolt, but they did with Type 1. Accordingly, “6.5 Grendel Type 2” will be stamped on the bolt of the Standard Grendel while most 6.5 Grendel Type 1 will have the word “SAAMI” stamped on the barrel. Aside from the difference on the bolt depth, these two 6.5 Grendel types are also the neck depth and the taper shape. The neck depth of 6.5 Grendel is 0.300 diameters while that of type 1 is 0.295 diameters. Also, the taper in the gun's throat of the Grendel is compound while of 6.5 Grendel type 1 is straight. For easier understanding, we summarize in the table as below, you can check it! 6.5 Grendel Type 2 vs Type 1: Which is Better? The original 6.5 Grendel with the bolt depth of 0.135 diameters has a disadvantage in comparison to Type 1. The deeper bolt face causes some problems on the bolt and extractor. Meanwhile, Les Baer Custom has the .264 LBC canister, well matched with the 6.5 Grendel. It has a design of a 7.62x39mm standard bolt as well. It, in the end, provides shooters higher flexibility to exchange the barrels between versions of AR-15s while saving your budget. But in the term of the gun’s throat, the Grendel’s compound shape is believed to make various ammunitions fire better. After comparing 6.5 Grendel Type 2 Bolt Vs. Type 1, have you chosen yourself a proper one? Each type has its strengths and weaknesses. So I think you had better choose the one you like and fit with your use and budget. If you see this information is helpful, share them with your friends or partner! Read more our recent post about best ar15 scopes here. It'll help you chose a good one for your ar rifle!